(a) Structure of pure anatase; (b) N/Ti3+/O vacancy defect complex with O opposite N; (c) "Merging" of two O into central position. In (b) and (c), the Ti3+ ion is obscured from this viewpoint. 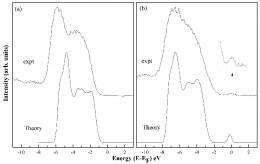 (PhysOrg.com) -- To produce "green" fuels, some scientists are looking for a little help from above. Sunlight is the key ingredient in photocatalytic water splitting, a process that breaks down water into oxygen and, most importantly, hydrogen, which could be used in future energy technologies like fuel cells. The problem is that the most effective photocatalysts, like pure titanium dioxide, are only activated by ultraviolet light. "Of the sunlight that reaches the Earth's surface, only about five percent is ultraviolet light," said NSLS researcher Abdul Rumaiz. "If we can alter titanium dioxide to react to visible light, we'd have the power of the entire solar spectrum." Recently, scientists have found a way to do that by adding, or "doping," a small amount of nitrogen to titanium dioxide. This slight change makes a big difference in the material's catalytic activity; nitrogen-doped titanium dioxide is highly reactive to visible light. At the NSLS, Rumaiz and a group of scientists from the National Institute of Standards and Technology and the University of Delaware set out to reveal what’s so special about the doped form of the material. "There was some controversy surrounding the electronic structure of nitrogen-doped titanium dioxide," said NIST researcher Joe Woicik. "We wanted to resolve that fundamental issue." The group analyzed samples made at the University of Delaware with hard x-ray photoelectron spectroscopy (HAXPES) studies at NSLS beamline X24A - the only facility in the United States that performs this advanced technique. HAXPES allows researchers to probe the electronic structure of materials deeper than regular photoemission studies, which are usually limited to surfaces. By combining this data with calculations carried out by the theory group at NIST, the researchers found out how nitrogen affects the overall material. (a) Theoretical DOS and the experimental valence band for pure anatase TiO2. (b) Theoretical DOS and the experimental valence band for N doped anatase TiO2. The curves have been scaled to equal peak height. "The addition of nitrogen changed the electronic structure both directly and indirectly," Rumaiz said. "The indirect one has the biggest impact." 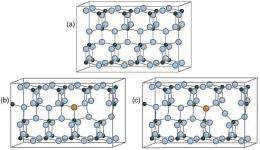 "This research is a really nice example of how closely tied the electronic structure is to the atomic structure of a material," Woicik said. Other authors include E. Cockayne (NIST) and Hong-Ying Lin, G. Hassnain Jaffari, and S. Ismat Shah (University of Delaware). Their results were published in the December 28, 2009 edition of Applied Physics Letters. More information: A.K. Rumaiz, J.C. Woicik, E. Cockayne, H.Y. Lin, G. H. Jaffari, and S.I. Shah, “Oxygen Vacancies in N Doped Anatase TiO2: Experiment and First-principles Calculations,” Applied Physics Letters, 95, 262111 (2009). The "Airy Light" article today says light sent through crystals, light waves bounce inside the crystal, changing their wavelength and color. These two teams need to get together and discuss how a crystal will work rather than doping.